This album made me want to play guitar more than any other (except maybe the first Van Halen album) because of Frampton’s melodic approach to songs. 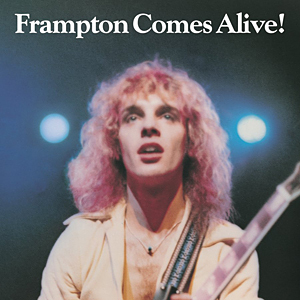 The first track included an introduction for Frampton as an ‘honorary member of San Francisco society” and goes right into one of the best tracks on the double-live album, “Something’s Happening”. From there the rest of the album goes from the acoustic to the talkbox and back. The tracks included 2 songs that clocked in at longer than 7 minutes including the AOR staple “Do You Feel Like We Do?”. The track was over 14 minutes long on the album. Listening, usually with headphones, the entire album was a commitment but well worth the time. An amazing set of the best guitar and songwriting skills around at that time and today. I still listen at least once a month and enjoy it just as much today as then. As a side story I had the pleasure of meeting Peter Frampton at the Memphis in May concert he played in 1999 (?). He was as gracious as you would imagine and we spoke for a few minutes about the weather (outdoor show) and the size of the crowd (huge). He seemed to still be a little nervous before going on stage which I thought was odd given the amount of shows he must have performed in his career up that that time. I had the chance to tell him what the album meant to me and he seemed genuinely appreciative of the kind words. Good guy.